Country's foreign exchange (Forex) reserves rose by $1.25 billion as on April 21, 2017, official data showed on Friday. 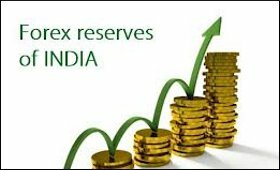 According to the Reserve Bank of India's weekly statistical supplement, the overall Forex reserves increased to $371.13 billion from $369.88 billion reported for the week ended April 14. Segment-wise, FCAs -- the largest component of the Forex reserves -- augmented by $1.23 billion to $347.48 billion during the week under review. The country's gold reserves were stagnant at $19.86 billion. However, SDRs' value gained $5 million to $1.45 billion. The country's reserve position with the IMF inched higher by $7.7 million to $2.33 billion.